Shooting Review: The Glock 30S | Eagle Gun Range Inc. The first time I picked up a Glock 30 pistol some years ago I noted that it felt like I was holding a potato. The grip filled my hand and seemed fat as compared to other pistols I’d held in my hands. Not bad, just more robust than most. I must have liked that because it was only a couple months later that I bought one. Full disclosure: most of the pistols I review are new to me and my review is about first impressions. Not so with this one. I owned an original G30 before the 30S was released and in 2014 I sold my G30 in order to get the G30S model. It’s lighter and slimmer than the original model and it’s a gem of a pistol; a .45 caliber thumper in a compact frame that, to me, just feels right. Except for the fact that it’s chambered in .45 ACP, the Glock 30S is perhaps my all-time favorite pistol. Why Consider the Glock 30S? The first and last reason to consider a Glock pistol of any variety is the simplicity and reliability. There is no more simple and reliable a pistol on the planet than a Glock. That aside, the G30S is purpose made for concealed carry—it is the compact version of the Glock 21 duty pistol. So you might consider carrying the G30S for its easy concealability (it’s a bit smaller than a G19). You might consider the G30S for its .45 chambering, as many folks prefer to have fewer large-caliber rounds rather than more smaller-caliber rounds on their hip. If you have larger hands, you might consider the 30S for its robust grip radius. It’s a double-stack .45 so it has a meaty grip that fills the hand. Despite the large chambering, double stack of large rounds in the mag, and meaty grip, the G30S is a relatively lightweight carry pistol at just over 30 ounces, loaded. The Glock 30S is a slightly downsized version of the G30. The primary features are the slimmer slide width (1” as opposed to 1.12”) and lower slide-assembly weight (it’s a full 3.5 ounces lighter than the G30 slide assembly) and with the SF frame, the 30S has a slightly shorter trigger reach and overall grip radius as compared to the plain G30. My Glock 30S as I carried it and keep it today. The Glock pistol frame is not what most would call comfortable. Rather, it’s serviceable, but it has the saving grace of being very easy to contour with a Dremmel sander for perfect fit and comfort. I believe that every Glock pistol frame needs contouring as well as stippling, so that’s how my 30S is set up. So for me, my Glock 30S fits like a glove. I expect that some will find the G30S grip to be more comfortable than that of other Glock models, owing to the additional girth. I do and my medium-sized find the girth and trigger reach to be just fine. The .45 ACP round has a bit of a punch as compared to 9mm and any .45 shot from a compact, polymer frame is going to deliver a bit of pop. That said, the G30S is in no way harsh or uncontrollable. The slightly wider-than-normal grip and the softness of the plastic render the pistol quite tame. I have no trouble whatever shooting an accurate Bill drill as fast as I can pump my finger with this pistol and, provided your grip is proper, this is an easy to control gun. As with comfort concerns, one can contour the frame to allow for better purchase of the support-hand thumb to assist with recoil management. One thing I’ll point out is that while the 10-round magazines allow for a full grip on the pistol for just about anyone, the 9-round flush magazine leaves a short enough grip that one’s pinky might not have good purchase on the grip. For those with large hands, the pinky might have no purchase at all. The result is not so short as, say, a G26, but the fact that this is a .45 may mean that some folks will desire the full grip provided by the 10-round magazines to help with managing the recoil impulse. I’m used to carrying a Glock 19 all day and I find that the G30S conceals even better than the G19. This fact is mostly due to the shorter grip. 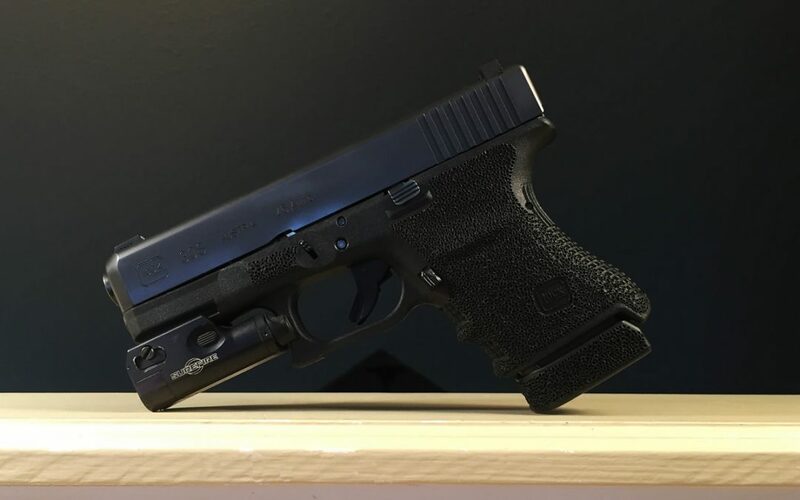 The slide is about the same width as the G19, but the frame is slightly wider, but only just so and the concealability difference is nonexistent. Overall, this is an easy-to-conceal pistol; and only a tiny bit heavier than a G19. The G30S is actually a bit lighter on your belt if you carry with the flush 9-round magazine. The typical, extended-looking magazines are 10-rounders, allowing for 11 in your gun. This capacity is not at all bad, especially considering the compact package and length of the grip. No complaints here. Well, it’s a Glock. The Glock 30S is built like every other Glock pistol and the frame has Gen 3 styling. The recoil spring is of the captured dual-spring variety. Like most Glock pistols, the G30S comes with polymer sights with the rear U-notch. 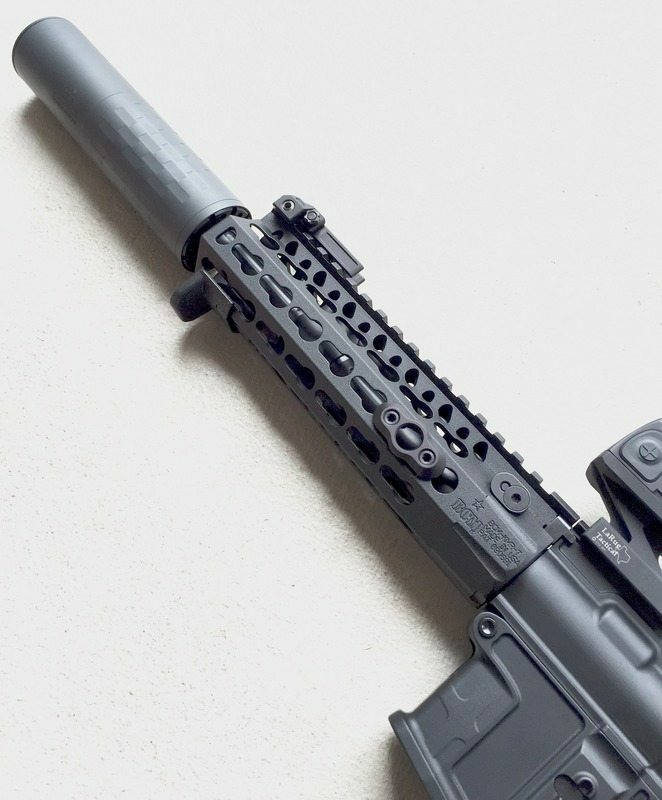 You’ll likely want to replace these stock sights with some sort of iron sights. The 30S slide has the bull-nose contouring at the muzzle port, but otherwise is like any other model. The slide-lock lever and takedown tabs are very low-profile, providing the simplest and sleekest external-controls complement in the business. Despite its simplicity and reliability, customization is a Glock’s best friend. Virtually every after-market manufacturer on earth makes replacement parts and accessories for Glock pistols and if you are of a mind to replace or augment components you’ll have the widest range of options from which to choose. Note, however, that unlike some Glock pistols the G30S does not have a reversible magazine release. If you’re a lefty, the G30S requires you use the magazine release as is. That’s no great hurdle, but it is a departure from nearly every other contemporary Glock model. Do use a Dremmel tool to contour the bottom/side of the strong-hand side of the trigger guard junction with the frame. It makes a HUGE difference in comfort. Do stipple the frame; both the grip and the forward area for your support-hand thumb. There is no pistol in the world (except the Glock RTF texture!) that has a frame texture that allows for enough grip purchase when your hands are wet (from rain, sweat, or blood) and the G30S is no exception. A stippled pistol is highly controllable and comfortable, to a degree not found on any non-stippled pistol. And, no, do not use adhesive grip tape. If you don’t train enough to melt or otherwise scrap it off, the tape’s grippiness is not going to help you much. Do replace the plastic sights with iron sights of your preference. Do not replace the slide lock with an extended slide lock. It’s a LOCK and not a release. An extended slide lock will get in the way of your manipulation of the pistol making it prone to not lock open on the last round of a magazine. Do not put a plug in the bottom of the grip. That opening is there to allow for your thumb’s access to help remove the stuck magazine in the event of a double feed malfunction. Do not replace your slide stop with a trapezoidal, extended slide stop. These extend too far out from the frame and are both uncomfortable for your hand when shooting and will destroy your holster…and will catch on things when you are manipulating your pistol. As for easy fieldstripping, you don’t need to do that so quickly that an extension matters. Do replace your recoil spring every 5,000-8,000 rounds – and use a factory replacement (only), not an aftermarket model of any kind. Do replace your trigger spring and slide-lock spring every 10,000 rounds. For more maintenance advice, see this article on maintaining your Glock. I carried the Glock 30S a couple of years ago and it was my daily carry pistol for about a year. I wore the pistol inside the waistband in the 5 o’clock position with a 9-round flush magazine in the gun and 2 10-round mags in an OWB mag pouch on my left side at about 8 o’clock. This rig concealed very well under a simple t-shirt, due in part to the compact nature of the G30S with the flush magazine. Even with the full-size magazine, the G30S has a shorter grip than a G19 (which is my daily carry now) so it is quite concealable no matter your carry location. 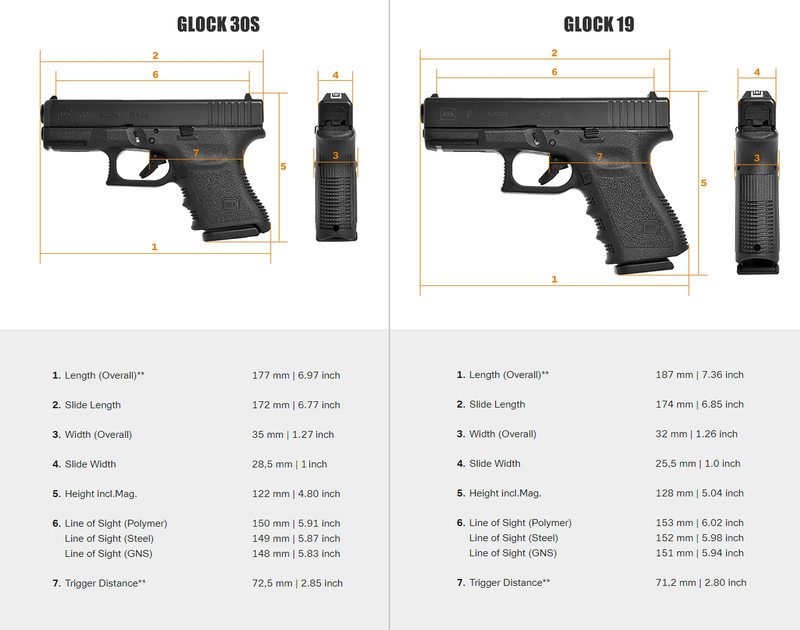 Fully loaded, the G30S is less than .4 ounces heavier than a fully-loaded G19, at 30.36 ounces. That’s not terribly light, but for a double-stack .45 pistol, it’s rather remarkable. I find that so long as you have a good carry belt it’s easy to forget you’re wearing it. And that’s not a glib platitude, but a fact based on prolonged experience. 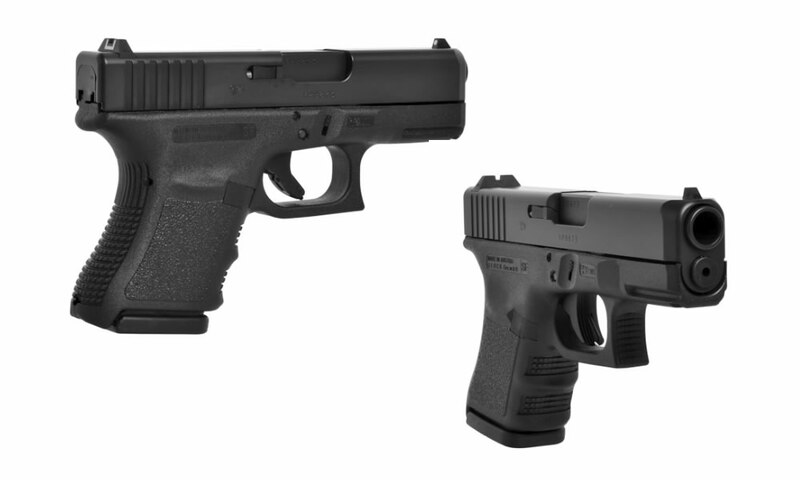 The Glock 30S is an easily concealable, compact .45 with good capacity vs. size and weight. It is as reliable a pistol as was ever made and it’s easy to customize; with a wide variety of after-market components and holsters available. Some with smaller hands may find the grip to be uncomfortably wide. The polymer sights just beg to be replaced with irons. The price may be a bit high for this pistol. It’s a Glock. It’s easy to operate and easy to shoot. The Glock 30S is likely the most comfortable compact pistol Glock makes, but it still requires some slight modification to be a truly comfortable gun. It is likely more accurate than anyone shooting it. I’m confident with it out to 50 yards. There is no more reliable a pistol in the world. The Glock 30S is among the most customizable pistols on earth. The Glock 30S is perhaps not for everyone, but everyone should try it. If you like the .45 ACP round and don’t mind its recoil profile, I think the G30S provides the perfect combination of size, weight, capacity, reliability, and concealability. Excellent review. I also had a G30 before going to the G30s, and for the same reasons. I also carried the 30s for a time before going to the G19. Improved defensive ammo (Hornady Critical Duty), greater mag capacity, and economics all played into the decision. The G30s remains my backup in a briefcase most days. It’s interesting that Glock developed the 30s at the request of the LAPD’s SIS Unit, to maintain their carriage of the unforgiving .45 ACP round in a more concealable package for plainclothes work. Admittedly, that was also factored into my purchase decision. The G30s is an awesome tool. Thanks for the review. Good review, totality disagree about the slide lock. 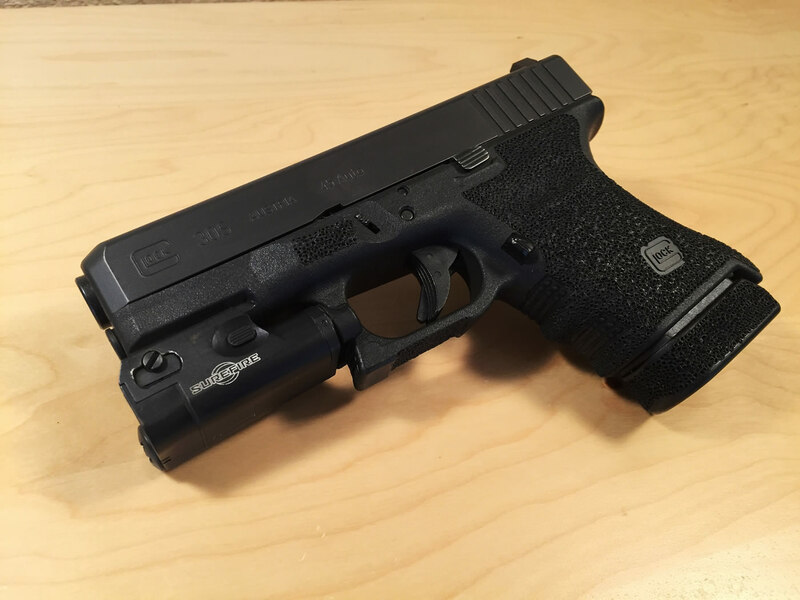 The Glock oem extended slide lock is an excellent upgrade. It allows for one hand release with VERY little extension. The chance of accidentally releasing the slide is virtually nonexistent. I think with the slide release he was just referring to the trapezoidal ones such as Sure Touch and Aro-Tech. These while probably very suitable for race and range guns might be a little sensitive for carry, concealed and otherwise. You are right about the Glock factory extended slide stop/release it is quite carry safe and reliable like most things Glock makes. BTW I don’t think Glock even makes an extended slide lock. Surprised how well I shoot my G30S. Its my winter, heavy coat pocket EDC. I do find it a bit thick for summer carry- until I lose some weight. I have large hands and it feels good in my hands- although I prefer the 10 rounds mags versus 9 for extra purchase. I don’t think the 9 helps concealability much. Andy didn’t mention that you can put 13 round magazines with a spacer- good for a backup or if you use the 30S for home defense.